I'll be the first to admit that I'm spoiled. I've lived in two different places over the last thirteen years and both were brand new. Our next house is brand new. Hell, even my childhood home was brand new. We moved in when I was five. I don't recall worrying about the cleanliness of things back then, but it was definitely of some concern during my apartment living years after college. 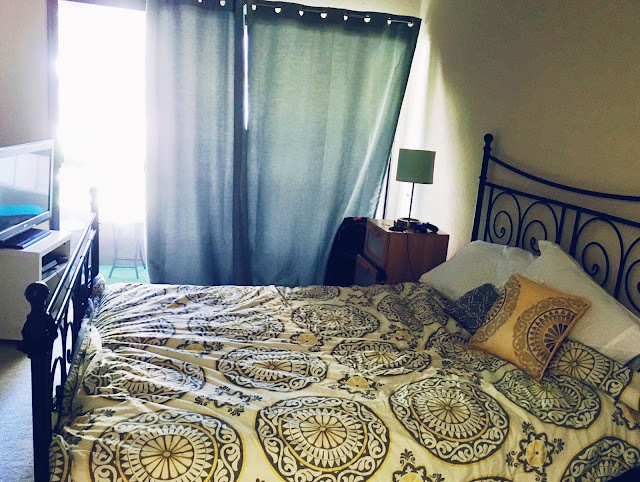 I cleaned immediately after moving in "just to be sure," and usually felt a little uncomfortable during the first few weeks. My obsessive cleanliness disorder has gotten worse and worse over time, making my transition to a 38 year old apartment really hard after living in everything is brand new land for so long. I'm not sure how I would feel about buying a really old home, especially if we couldn't afford to renovate it right away. When I think old home I also think dirty. I do realize that's not always the case, but when I come into a very old space where I don't live, have never lived, and don't know who lived there before me, it kinda creeps me out. It just does. Unless the place is pristine, I'm probably going to feel uncomfortable. Our options were limited. We wanted something furnished, couldn't sign a long term lease, and we were in a hurry because we'd sold our house. Also. San Diego is expensive, as is, but becomes even more expensive if you can't sign a 6 month to a 1 year lease and have to pay $500 per month more for the privilege of month to month or a three month lease for the very few places that even offer that option. We physically looked at three places total. Two were in a super cool area, but one was too tiny, one was too dirty, and both of them were pretty old. The third, was also old, which inherently creeps me out, but it didn't set off too many alarms. The fridge was spotless, the carpet was mostly spotless, the price was doable and there was parking for two cars. I had to filter through a lot of scams and BS, but Craigslist has never let me down. The price was reasonable, and the location couldn't be much better. It would do. Technically, it's a condominium, because all units are individually owned, but since it doesn't have a washer/dryer inside, it feels like an apartment. Unless there has been some kind of renovation, meticulous upkeep, and/or consistent deep cleaning over the years a living space is going to get a little dingy after 38 years. And let me tell you, there are no signs of renovation anywhere in our apartment. The place is straight out of the 1980's. It's dated and worn, smells different, and doesn't feel like home. I wiped every surface with Clorox wipes. I cleaned the tub, and swiffered the floors, which helped my anxiety, but I was pretty miserable when we first moved in. I didn't want to take a shower. I didn't want to use the silverware. I didn't want to be here. Mind you, my husband didn't have a problem with any of this. He hopped in the shower before I had a chance to clean it, and settled in like a champ while I wiped out drawers, and cabinets before reluctantly putting our things inside, staring glumly at the discolored grout on the tile countertops. I found comfort in my favorite coffee mug from home, and used one of our throw blankets to cover the hard scratchy material of the linens in the living room daybed, which also doubles as our couch. If this were going to be a long term situation, we would have our own furniture, our own decor, and I might not have to drink wine out of a mug, which is not the same! I probably wouldn't have cared in my twenties, but drinking wine out of a mug totally killed the experience for me. We have a small measuring cup from our Instapot, so I used that until I got my hands on some of those disposable plastic wine glasses. Anyway. The point is that it's a temporary living situation, and most of the stuff in here doesn't belong to us. Shabby chic 80's retro isn't my taste, but we really aren't a position to make it our own. Confession time. I wasn't sure if I wanted my friend to spend the night because I was kind of embarrassed of my house. This was a new feeling for me, and I didn't like it. Nothing is organized. The living room is full of boxes, and there's clutter I can't get rid of. I couldn't offer her a guest bedroom. Not only that, but would she mind bringing her own bedding and her favorite coffee mug? I didn't feel comfortable inviting someone into a place where I don't feel entirely comfortable myself. I know my obsessive cleanliness disorder can't be helped. It's as much a part of me as my fear of spiders and bugs, but feeling embarrassed of where I live because it's not so nice made me feel shallow, and ungrateful. It made me put things into perspective, and frankly get over myself. How stupid would it have been if I missed out on time with my friend because my apartment is a total mess? It wasn't a big deal to her and we had the best time as always, because my living space doesn't matter. Normally, I straighten up for guests and don't make them bring their own stuff, but this is where we're at right now, and I needed to spend less time being embarrassed because our apartment doesn't have any special "moments," and more time being grateful that we have a decent place to live. In case you thought a moment was a segment of time, it's not. It's actually a nice place to take pictures. If you don't believe me read this article about a Penthouse made for Instagram. This is what the world is coming to. I consider myself to be humble and deeply appreciative of everything I have, but in that moment of embarrassment, I allowed myself to get a little bit carried away for a second, feeling like it matters a whole lot more than it actually does. I did a quick apartment tour on Instagram stories. Not doing so would have felt inauthentic, because I'm pretty sure I'd have done it without hesitation if it looked anything like the Instagram Penthouse. Well, whatever. This is my life, and this is where I live and it may or may not be aspirational or pretty, but so what. This is what we could afford, and it's okay. So what if it was long term? What if this is what we could afford for the long run? Well. The only way 700 square feet with a teeny tiny kitchen even works is because 95% of our belongings are in storage. We'd have to get rid of almost everything we own, and it would be a serious step towards minimalism once and for all. I've gotten more comfortable here over time, but admittedly, I would not be happy about it. If we were staying I'd have remind myself that in the grand scheme of life having space to cook and store luggage or the type of material my kitchen countertops are made of is really not that important. Having a roof over my head? Being able to put food on those countertops? Now that's important. I think it's okay to have standards about the type of place you would like to call home, but never forget that you are lucky at all if you get to have standards in the first place. Not everyone has that option. Transitioning to apartment life temporarily is a new adventure for us. Even if the inside left much to be desired, the location is perfect, and we've been taking full advantage of it. We're making it work, and have enjoyed plenty of special moments since we moved in. The real kind. The kind that matters. Such a great post. I thought you misspoke when I read the moments part ... crazy to think this is what our world has become. We are no longer appreciative of what we have. To have an instagram home just to pretend that you're something (or have something) that you're not ... how incredibly odd. Perspective is such a great thing to have. So many especially in this day and age who do not have it at all.